Physical characteristics: Common diving-petrels are 8 to 10 inches (20 to 25 centimeters) long with a wingspan of 13 to 15 inches (33 to 38 centimeters). They have the same bluish gray or darker and white coloration as other diving-petrels, and their legs and feet are bright blue. Their feet get even brighter during mating season. Their nostrils project upward. Geographic range: Common diving-petrels are found in the Southern Ocean between 35 and 55° South latitude. They breed on islands off Australia, New Zealand, Chile, Argentina, and in the south Atlantic and Indian Oceans. Habitat: Common diving-petrels feed in colder ocean waters close to breeding sites. They breed on oceanic islands. Diet: Common diving-petrels dive into water to catch small fish and crustaceans such as crabs and shrimp. Behavior and reproduction: These social birds fly low and fast through both air and water. 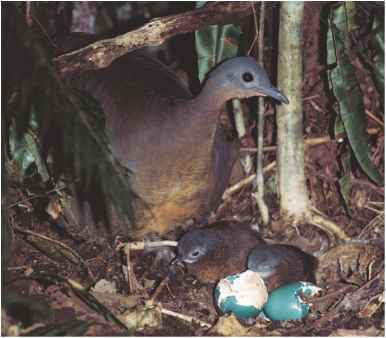 The female lays a single egg in her burrow or crevice, and the egg is incubated for eight weeks by both parents. Scientists estimate the lifespan of the common diving-petrel to be three to four years. Kelp gull, giant petrels, and skuas, aggressive birds that feed on smaller species, feed on these smaller birds, remove large numbers from the population each year. Common diving-petrels and people: Bird watching of the common driving petrel benefits the ecotourism trade. Parkinson, Brian, and Tim Lovegrove. Field Guide to New Zealand Seabirds. London: New Holland Publishers, 2001. Warham, John. The Behaviour, Population Biology and Physiology of the Petrels. London and San Diego: Academic Press, 1996. "Birding." Birdwatching.com. http://www.birdwatching.com/ birdingfaq.html (accessed on May 26, 2004). "Common diving-petrel." Australian Government, Department of the Environment and Heritage. http://www.antdiv.gov.au/default.asp?casid=1552 (accessed on May 26, 2004).